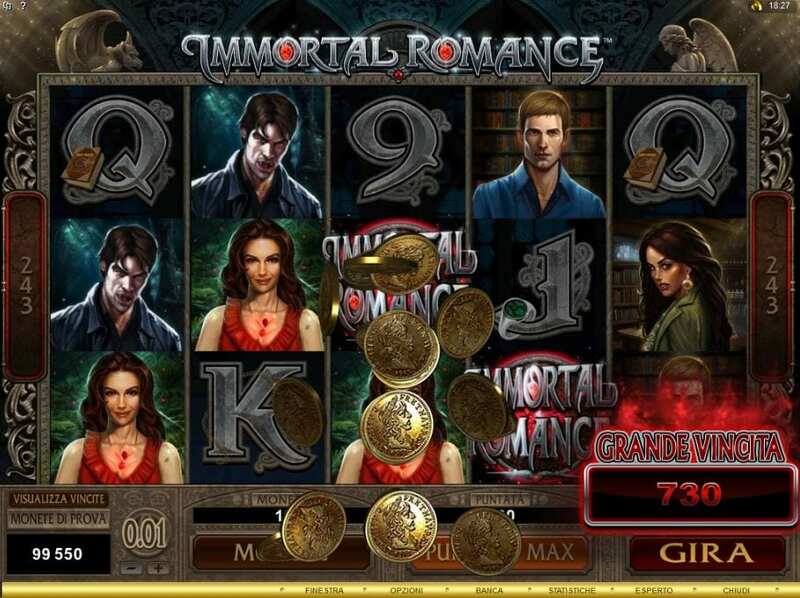 Immortal Romance is the new Vampire themed slot game from Microgaming that sure to prove popular amongst all players. Here's a superb new slot online game from Microgaming. Love is such a powerful thing. It can cause us to act in ways we never thought we could, all for just one chance at eternal happiness. How long does love last you might ask, this is essentially the same question as to how long is a piece of string; both are entirely dependent on the situation at hand and just who’s involved. For more slots options, check out new slots online! Those of you in love right now will no doubt find similar ground in Microgaming’s slot: Immortal Romance. We’ve all dreamt of a love once lost but here you will keep the magic alive for as long as you desire. Yes, it does feature vampires and yes, it is of a gothic theme but doesn’t forget that vampires have the closest attraction to romance, lust and having that feeling pulsate through their veins. Although love between vampires and other creatures are forbidden, it still doesn’t stop these beings from living out their lives in the ways they want too despite any prejudice. Micro gaming happens to be the masterminds behind Immortal Romance, known for their interesting take on themes and emotions that we all love and know so well. But enough about the soppy descriptive stuff, let’s talk about the game! Immortal Love is a video slot that has around 243 paths to victory. Initially releasing in December 2011, Immortal Romance has been a mainstay in Microgaming’s catalogue of titles. If you’ve played Thunderstruck II — another one of Microgaming’s titles — then you will no doubt find a somewhat similar beat here too. This one happens to have better features though just saying. Microgaming is proud to be amongst the world leaders when it comes to knowing what to do in the online casino gaming industry. Their products include a range of sources such as casino, multi-player, mobile, poker, and bingo and as a result of all this vast experience, they have every right to call themselves world leaders and they are one of our favourite developers here on Wizard online casino. With their take on the gothic theme, with Immortal Romance, launch yourself head first into this world and see what fortunes await for you – hopefully more than stinking garlic! Opening its doors in 1994, Microgaming is one of the most progressive game companies in the entire world. 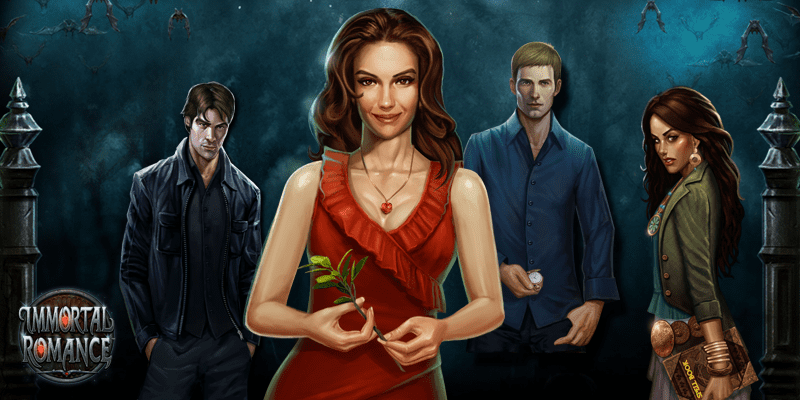 Their Casino Slots are particularly good so it's no wonder why Immortal Romance is one of the worlds favourite slots. After the release of their Viper software in 2002, the company saw itself sail to new heights to both players and their peers alike. Over the past 10 years, Microgaming has paid out more than 100 million in jackpots since its inception. Now that’s impressive. Microgaming: the record-breaking game developers are here and in full swing, ready to give players the types of online experiences you never forget. With titles such as Mega Moolah, Lotsaloot and Major Millions under their belt, it’s plain to see how they have managed to create such a reputation for themselves as one of the go to developers for winning rolls. Immortal Romance is full of features and bonus rules that make it a thrill to experience firsthand. There are wilds in this title, the wild of course substitute for other symbols in the reels when involved in the winning pay-line. The golden lion symbol — which happens to be a doorbell/ knocker — is these titles scatter. The scatter will double the player's winnings when in a winning combination only making it a key symbol for players to look out for. There is a feature in this title where wilds will begin to not function during the wilds desire feature. This feature is randomly triggered turning some symbols on the reels into wilds for the player to then manipulate in their own accord. Free spins cannot be triggered in this feature, unfortunately. Still, it's best to find out more games you can choose from! There is also a chamber of spins feature which in turn can trigger even higher scores with the introduction of even more higher scoring symbols into the fray. There is one bonus round that will open this eternal romance into a free spin territory which will once again open more avenues for potential high scoring pay-outs! With countless supernatural TV programmes to watch and enjoy instantly such as The Vampire Diaries, Supernatural and True Blood! Microgaming now brings you this gory gothic theme to sink your teeth into with Immortal Romance, just beware of the wooden stakes and garlic to avoid mortality and you might be rewarded with a handsome cash prize in return – just about as handsome as the vampires that appear in this UK Slot! The reels are set against a grisly grey stone background, decorated with ancient gargoyles and statues to represent a haunted house, setting up this theme perfectly! This 5-reel slot game offers an enticing 243 ways to win, and there are a number of bonus features to lust over – just don’t develop a fancy for blood lusting, as we can’t save you from that! But this game can save you from an evening of boredom and with bets starting at just 30p with the max only standing at £30, we can guarantee you will find a thirst for this game! The game’s logo represents the wild symbol, and it will substitute all ordinary symbols on the reels, giving you a second chance to match symbols and reap in the winnings! As a bonus, any wins you do pick up by the wild symbols contribution, you will gain a x2 multiplier! the Golden Lion Door Knocker represents the scatter symbol and by acquiring 3, 4 or 5 of these will reveal the Chamber of Spins and this unlocks lots of exciting bonus features as well as more understanding of the love story underway. One of these features introduces you to Witch, Amber and her best friend, Sarah has confessed to being in love with a vampire, named Michael. Amber will provide you with 10 free spins with a x5 multiplier of all the wins won within these free games. Then you will move Troy, whose main ambition is to achieve power and pleasure, and he develops an interest in Sarah. Unveiling this part of the story, you will be rewarded with 15 free spins and a Vampire Bats feature that enables bats to flitter across the screen, randomly turning symbols on the reels into x2, x3, and x6 multipliers. The final chapter to this triangle love story is the revelation that Michael is equally as obsessed with Sarah but does not want to reveal his true vampire nature! This bonus game rewards you with 20 free spins and Rolling Reels, which means there is a very high chance of attaining consecutive wins! Immortal Romance is a blood-sucking adventure of seismic proportions, you’ll fall in and out of love so many times that you’ll begin to question your own reality. This is a love story and one that you’ll follow even outside of playing, the hidden story that is played through bonus features and spins of the reels, you really want to see this story play out in-front of you. If you enjoy 5-reel slot games that play towards a certain theme, then you will find solace here.